The vagaries of fortune are ever present in the mobile slots world and Betsoft Gaming turns to the tried and true mysticism of the fortune teller with the introduction of its 3D character Gypsy Rose. 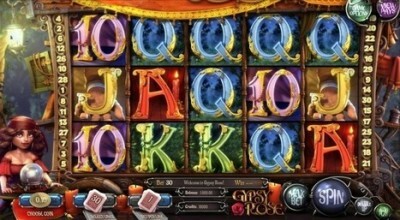 Gypsy Rose is a five reel slots game that reveals its prophecies on 30 win lines. The predictions com eat the sacrifice of just 0.02 coins and you can bet as much as 1.00 coin per line. There is no progressive jackpot in your future but your fortune lies in bonus games. The doe-eyed Gypsy Rose is ready to deploy her full arsenal of fortune telling weaponry in your pursuit of future riches. At her dextrous fingertips are a crystal ball, tarot cards, potions and a magic book. A crow flown in from the void and able to see the past, present and future simultaneously is also at hand. Stylized upper value playing cards assume the role of minor symbols. One thing you will learn quickly from Gypsy Rose – you are going to need the help of all her charms working together to bring you wealth. The Crystal Ball is the foreteller of many prizes in your future but only when it spins on the centre reel. When it stops with a Potion on either side 12 free spins are triggered. There is no multiplier attached during the bonus time but the free spins can be re-triggered time and again. In the Crow Wild and Respin feature when the Crystal Ball on Reel 3 is flanked by two Crows the trio all turn Wild for a single re-spin which guarantees a four-of-a-kind payline with a reasonable chance at a full five symbol payoff. The Magic Book Instant Win occurs when the potent Crystal Ball is bookended by the Magic Books and you don’t need a fortune teller to predict what happens next. Yes, it is an instant win, revealed in the pages of the Magic Book. The Crystal Ball works in tandem with the Tarot Card to unveil a new screen with a table of 15 tarot cards of five kings, queens and knaves of different colours. Your task is to choose seven and the better you do at matching the bigger your multiplier bonus. There is also a Wild Card haunting the proceedings. If it shows its power on Reels 1 and 5 at the same time the symbol that is most prevalent on the reels at that moment will become wild so the screen can be littered with four, five, six – who knows how many? – wild cards that will deliver the best winning combination possible. Now that is a future you will want to be a part of.